Our tippers are popularly used in industries like construction, mining, and other industries that require transporting of heavy goods and materials. 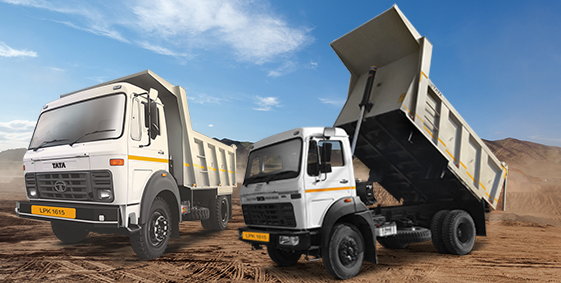 The tipper range by Tata has an edge in the prevailing heavy duty construction-truck industry with its superlative performance, quality, strength, reliability, durability and profitability. These come fitted with best in class hydraulics and offer best tipping and performance. Vehicles are fuel efficient and offer very good fuel efficiency. What are some of the best options available in the category? Tata LPK 1615 - Packed with a Cummins ISBe 5.9 180 40 engine producing a maximum output of 134 Kw at 2500 RPM, the Tata LPK 1618 is offered primarily for the mining and construction industry. The tipper boasts of a GVW of 16,200 kg. The 5883 cc engine is BS IV emission compliant. A gradeability of 42% makes it an ideal choice to travel through narrow lanes. 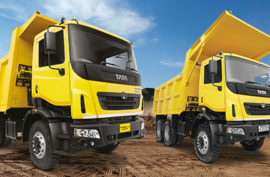 Tata LPK 1618 - The Tata LPK 1615 is a medium duty tipper, backed by a Tata Cummins 6 cylinder diesel engine that has a displacement capacity of 5883 cc. The engine is capable of producing 118 Kw at 2500 RPM with a peak torque of 600 Nm at 1200-1700 RPM. This range of tippers are best suited for surface transport movements as they produce the best in class mileage for aggregate/ coal movements on surface transport applications. Tata SK 1613 - The Tata SK 1613 tipper is yet another great performing tipper by Tata. This vehicle is capable of producing a maximum output of 100Kw@ 2400 RPM and a peak torque of 490 Nm at 1400 RPM. The engine’s maximum capacity is pegged at 5675 cc. The Tata SK 1613 tipper comes with a hydraulic power steering and a 26% gradeability that makes driving easier and comfortable. This range provides extra safety due to its semi forward cabin. This is a preferred choice for sand as well as aggregate movements on narrow roads. Tata LPK 1613 – The Tata LPK 1613 delivers great performance, especially on plain roads. A Tata 697 TCIC diesel engine gives it the power to produce 100kW at 2400 rpm power and 490 Nm torque at 1400 rpm. This is easy to maintain vehicle which gives good fuel efficiency. 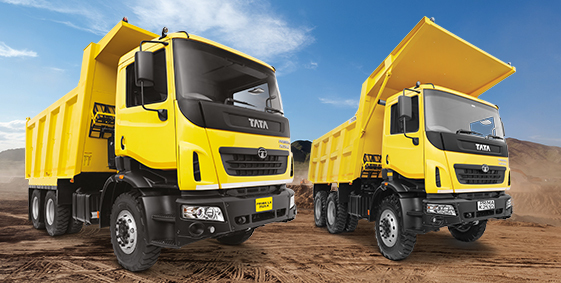 Here’s a quick glance at the 2-axle tippers offered by Tata.